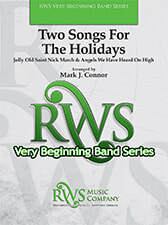 Using just the first six notes and simplified rhythms, “Two Songs for the Holidays” features two Christmas classics and is scored for success. “Angels We Have Heard On High” and “Jolly Old St. Nicholas” are written for beginners to be played at their very first holiday concert. Playable with a flexible instrumentation, this is a welcome addition to holiday literature for our youngest musicians. Written in a march style here, Jolly Old St. Nicholas is a traditional Christmas song based upon a poem by Emily Huntington Miller, written in 1865. Written in 1862, Angels We Have Heard on High is based on a French song with lyrics by James Chadwick.